Wading through the crowded streets in front of the Santa Monica Pier, trying to push our way through the thousands upon thousands of people gathered to cheer on their friends and family as they crossed the finish line of the LA Marathon this past Sunday, it was hard to believe that we were witnessing a tradition that began over 2,500 years ago in ancient Greece. Security personnel keeping spectators off the track, participants draped with thermal blankets reminiscent of oversize sheets of tin foil, ambulances carting overly exhausted or incapacitated runners to safety: none of these aspects were even remotely possible when Athenian courier Philippides purportedly ran the first ever Marathon in 490 BC. "Hey, the first guy who ever ran one of these things died!" remarked a friend of mine we ran into at the finish line. "So just finishing one is an accomplishment." My buddy who actually ran the race didn't have a look of accomplishment on his face. 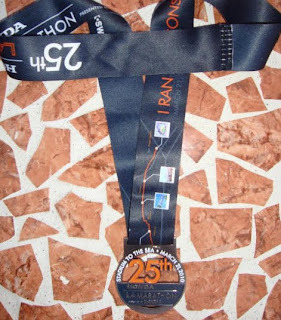 He limped along with sore feet, his head weighed down by his congratulatory medal, solar blanket draped over his shoulders like the vision of a super hero envisioned during the scariest part of the 1980s. And who could blame him? He had just ran the most he ever had in his life, and he didn't even have the mission to inform his sovereign city-state about a crucial victory in an ongoing war against an invading army of barbarians. Kind of makes you wonder... why? I expect the answer to this question for the average marathon runner is very similar to the answer given by famous mountaineer George Mallory when asked why he wanted to climb Mt. Everest: "Because it's there." Yes, a stretch of road spanning 26.2 miles is most certainly "there" - many great cities in this country of ours feature dozens, if not hundreds, of such stretches. 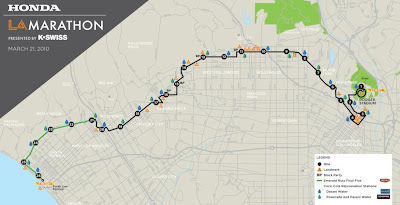 But the particular 26 miles comprising the course of the 2010 LA Marathon are particularly unique. And this unique quality can be described in two words: I RAN. I saw these two words on the ribbon holding my friend's medal around his neck - but when I first saw them, I misinterpreted them as one word. This is a bit political, I thought. Taking these good-natured athletes, who just want to push themselves to their physical and mental limits, and turning them into some veiled commentary on the nuclear arms race in the Middle East!? Shame on you, City Fathers! Then a breeze came in off the ocean, blowing aside my friend's thermal tin-foil blanket from his shoulders, which had been obscuring the rest of the message printed on the ribbon: "I RAN THE ICONS OF LA." Well, now, that makes slightly more sense. And the course of the marathon did indeed take participants on an iconic journey through many of the city's most famous and historic landmarks. They began by running a lap around Dodger Stadium, then took them south-east on Sunset Blvd/Cesar E. Chavez Ave, which at that point makes up part of Historic Route 66. After the runners have gotten sufficient kicks, they loop around past City Hall, the Walt Disney Concert Hall, and Echo Park back to Sunset. Through the suburbs of Silver Lake they go until Sunset turns into Hollywood Blvd, taking them past the El Capitan, Grauman's Chinese, and the Kodak Theater, the site of perhaps the biggest upset in Academy history. Down Orange, back to Sunset, past the Hollywood In-N-Out, through the heart of the Sunset Strip, down world-famous Rodeo Drive, past Century City, through UCLA, then straight on to the Pacific Ocean and the Santa Monica Pier. It's quite a sight-seeing tour, full of cultural and pop-cultural mainstays. Factor in the crazy businessman who ran the whole race in a suit, the group of guys dressed as Elvis blasting some of The King's grooviest tunes from a boom-box contained in a stroller, and the proselytizer who strapped a five-foot crucifix to his back, and you've got yourself quite a remarkable event. And that's just what an organized Marathon is: an event for the sake of an event. It wasn't about the $100,000 grand prize that the city hands out to the runner with the overall best time (after a suitable handicap has been granted to the women runners, of course). It wasn't in remembrance of that famous Athenian courier, who ran the 26.2 miles from Marathon to Athens, wearing a full panoply of Hoplite armor, only to announce "Rejoice, we conquer!" and fall down dead immediately afterward. Heck, that story is probably apocryphal anyway. Herodotus mentions that Philippides covered the 150 miles between Athens and Sparta in just under two days, but there's no mention in his Histories of any messenger sprinting from Marathon. The Marathon first gained popularity when a couple of Frenchman latched on to an uncorroborated legend to help bolster popularity for their brainchild: a revival of the famous Olympic Games. Who cares that traffic in Los Angeles came to a complete and utter standstill the entire day? Or that the finish line was so crowded and disorganized that it was practically impossible to catch a glimpse of your friends as they stumbled across? Or that primo parking for the event could cost upwards of $40 a spot? A Marathon is about inspiring togetherness, and fostering a sense of wonder at these poor fools who are willing to put themselves through a grueling ordeal, just to be able to say that they did it.